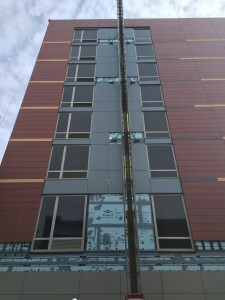 Huntingtown Md Contractor, Scheibel Construction, called on Xlnt Tint of Owings Md when they need EXTERIOR WINDOW FILM applied to a 6 story Hotel. A combination of Swing Stage and FRACO Lifts were used to apply the film and the silicone attachment. The resulting product looks remarkably like spandrel glass. Call Xlnt Tint for more information on EXTERIOR WINDOW FILM 410-257-5511.